Let them see you mean business by showing off the hours of devotion in the crafting of your arms, shoulders, chest and lats. Our T-back is a must-have muscle singlet. We know you like lightweight, quality gym tops which wash well, dry quickly, and are easy to cram into your gym bag when you're in a hurry. 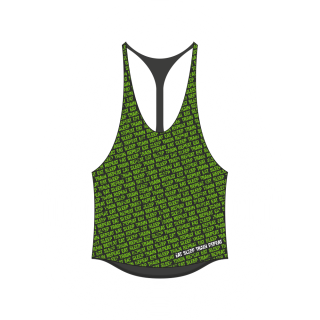 Available in black with BP-green detailing and a stylised patterned on the front which reminds us to "eat, sleep, train, repeat". We tried to think of something else to put on there, but realised nothing else really matters to us gym rats.